But there's something about summer making me a bit braver - aswell as Blood Orange's influence being all over the HS this spring summer (mules, bags, tea dresses) - so I've expanded my colour wheel, to fire shades of orange. Thumbs up to my strappy tomato red heels, with complimentary vivid coral toe nails. Whilst makeup wise, I've had MAC's lady danger (a bright coral red) on my wishlist for a while now, but as someone who cannot justify over £15 on a lip product, the including-(flattering)-orange-into-my-makeup-strategy, starts with Rimmel's Orangeology. 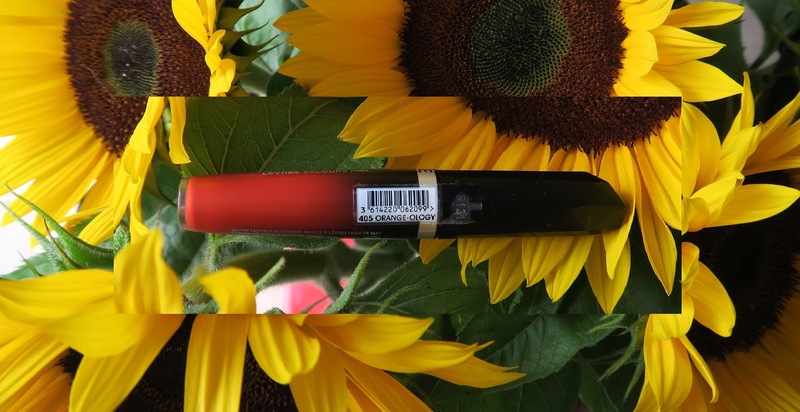 The Rimmel 'Show off's', I believe, are the american equivalent of the 'Apocolips' (which is a much better name in my opinion) - a liquid lipstick offering from the highstreet, with both glossy and matte formula options. Discountinued from our UK Shops *moment of disapointment* but I managed to find mine through a discount store 'The Factory Shop' for £2, and Amazon has them priced reasonably. The 'Show Off' matte has a light, smooth and opaque formula; shade Orangeology, being a vivid Tomato, staining sort of red, that doesn't do wonders for your teeth but is statement enough to distract you from that. Application involves one even swipe, going back to neaten lines, but without the need for layering or rediping into the tube. Not immediately matte - though does set down, and darkens slightly when it does so. The formula doesn't dry to a non transfer finish, but that sacrifice is preferred for me, as some moisture is retained, making it very comfortable and forgiving on the lips. That being said, I don't find it smudgey, just not 100% smear/sip of tea/fool proof. I find it wears well, fading evenly with a staining effect. Below photo is around 4 hours post application; more translucent than it once was, but even. The formula is light enough that I can reapply, build another layer smoothly, without having to wipe off the other - though I wouldn't reapply more than once, instead remove and start again. It's been a summer favourite paired with simple dresses, as a pop with denim, or when the 2 combine^. A formula like this also makes it easy for a lip product-aphobe (like me) to embrace trends and colours without wanting to wipe it right off - so I'd be interested if I came across other colours, in this matte formula. Back to this colour tho' - my new Orange philosophy, is Orange-ology. It's cracked the formula for rocking orange and red, by mixing the 2. So if you're not a toothy smiler, or this is your kinda colour, then I don't think you'll find a lip product better. If you can find it!